The increasing growth in number of NGOs and the widened scope of its activities is no longer limited only to the execution of the projects but also concerned with raising peoples participation and influencing the decision makers and Government at National and International level.In developing country like India there is no proper system by which technical assistance is provided to the NGOs for its management. Many of these NGOs which promote rural employment, technical education, and services for weaker sections are devoid of a systematic help and guidance from any source, except where they themselves have initiated to hire the experts and pay them for scientific assistance. 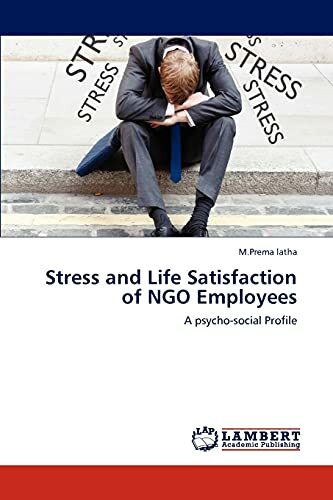 Realizing the importance to encourage the hard work and dedication of the NGOs,an attempt is made to examine psycho-social profile of NGO employees and thereby facilitate to strengthen the NGO management and improve the employees status in NGOs.The psycho-social wellbeing namely stress and life satisfaction is taken as key variables to explore the extent of stress the NGO employees experience in their individual,group and organization stage and to study the level of life satisfaction they derive from their job. M.Premalatha,Professional Social Worker,specialized in Community Development is a gold medalist of 1998 from Bharathidasan University. She has obtained her doctoral degree in Social Work and serves as an Asst Professor in Department of Social Work,Karpagam University, Tamilnadu,India. Her passion is to teach and explore through social research.